Dylan's Legacy Keeps Growing, Cover By Cover How much of Bob Dylan's staying power comes from his signature craggy voice? And how much comes from the poetry of his songs? 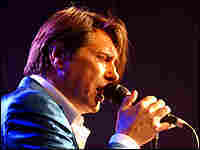 It can be hard to separate the two, so it's intriguing to hear his songs covered by the likes of Bryan Ferry. How much of Bob Dylan's staying power comes from his signature craggy voice? And how much comes from the poetry of his songs? It can be hard to separate the two, which makes it especially intriguing to hear Dylan's songs sung by other people. Today, Bryan Ferry releases a CD of Dylan covers called Dylanesque. He's been singing the occasional Dylan cover since 1973, when he was lead singer of the synth-pop band Roxy Music. He's not exactly a natural Dylan impersonator, but music writer Keith Phipps says that that's besides the point. "Part of what makes a Dylan cover work is when you have something exciting and unexpected and not Dylanesque to draw on," Phipps says. "That's why, when Ferry [covers] Dylan, when it works, it's nothing you'd expect. It's sort of this velvety, smooth, world-weary voice that seems to be untouched by time." 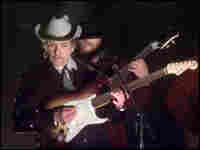 Of course, Ferry isn't the first or last to pay tribute to Dylan's music. "Knockin' On Heaven's Door" has been recorded dozens of times — as folk music, hard rock, hip-hop and reggae. "Dylan lays down something that's so open to interpretation," Phipps says. "His voice is inimitable. You can probably do a Dylan impersonation, but you're not going to do the same thing he does. No one else sounds like that."